One hundred different traits for Elf characters and NPCs. The elf has long pearl-colored hair that seems to glow in the moonlight. Complete lack of body and facial hair. Tangled hair which stays unnaturaly beautiful. Normal human ears, but corkscrew outwards. Pointed ears that twist into screw shapes. The elf has an expression they have constantly just smelled something foul. 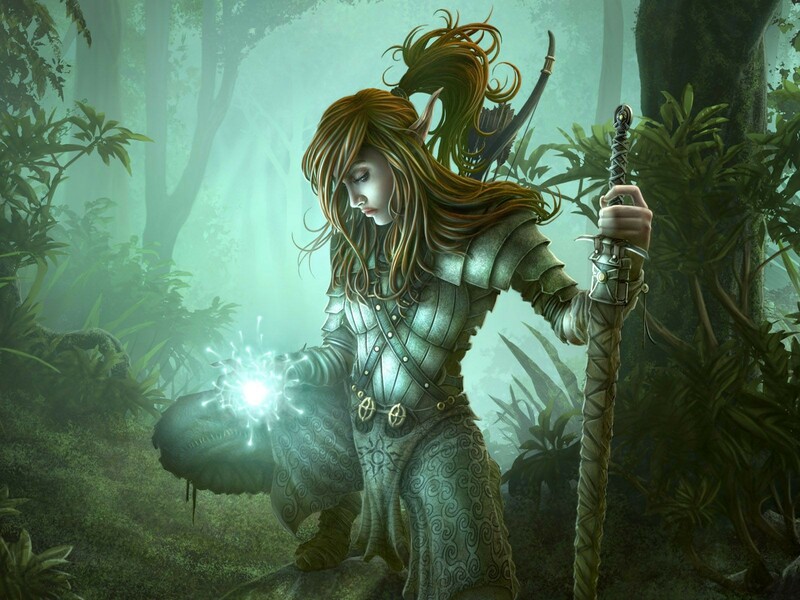 Elves can hear anything spoken within contiguous forest, but only if the tips of their ears haven’t been cut off. Elves have no nose; they smell with their ears. Elves cause an intense allergic reaction in most other races. Light peach fuzz beard which is quite the achievement for an elf. Has splotches of pale skin from a distant Drow ancestor. Has a recessive extra finger on each hand. Needs glasses to read, but can see distant objects with crystal clear clarity. Tends to snore while awake if bored. Will occasionally scratch out fairy dust-like dandruff. A friendly little chipmunk sits on the elf’s shoulder, he occasionally seems to have a conversation with it. Is of a noble house. Has few scales from a distant demon fay ancestor. Does not speak with words yet is understood completely. Has never met a non-elf humanoid. Has lost a cherished friend recently under strange circumstances. Serves as a assistant of an advisor to the high elven council. Whenever the elf laughs, a gentle breeze carrying the smell of spices and spring briefly flows around them. The elf has moderately sized vestigial wings that they spread and flap unconsciously whenever they feel a strong emotion. The appearance of the wings varies depending on what sub-race the elf is: high elves possess the wings of birds, wood elves possess the wings of insects, and dark elves possess the wings of bats. The elf’s shadow moves and sways in accordance to the current wind, ocassionally detaching from the elf for a few seconds as it follows the pattern of the wind. Can change gender slowly over time. They have perfectly symmetrical blemishes down the entirety of their body. They have a scar where an extra finger used to be. Their face is always completely emotionless, even when their voice and body language says otherwise. If their hair is cut, it always grows back to it’s original length after a few minutes. The elf is notably portly and extremely touchy about it. All the blood in their body is faintly bioluminescent, causing their veins to glow in complete darkness. Has metallic irises – silver, gold or bronze. Has short stubby fingers that look more like dwarf hands than elf ones. Has an extended middle finger which projects notably beyond its fellows. Has an extra joint in their little finger. The elf’s body is tinted green, and their arteries and veins look green under the skin. The elf’s body is so pale and their skin so perfect they could be a porcelain doll. The elf’s body and complexion is ruddy, and they are subconsciously drawn to spilt blood. The elf has a variety of different earrings lined up along their long pierced ears. The elf wears their long hair in a complex braid. The elf has a rather prominent underbite. Greenery rapidly grows and then withers wherever the elf steps. The elf has filed their teeth to points, or is that their natural look? The elf has small branched antlers like a deer. The (female) elf is with child, but that child is currently gestating within an enormous acorn the elf is carrying. The elf’s eyes lack pupils. They are all iris. Somehow this doesn’t affect their sight. The elf has eyes like a leaf-tailed gecko. The elf’s hair grows in gentle gradient of color, one color at a time, to create a subdued rainbow effect. The elf has a massive spray of brightly-colored ear hair. The elf has an enormous beak-like nose which they are very proud of. Wears heavy golden earrings, so his earlobes are stretched to the point where they almost touch his shoulders. An old battle wound across his cheek must have unnerved his sence of beauty to a degree where he started to wear a porcelain halfmask to cover up his left side of the face. The elf only speaks to people through psychic cantrips, but only because normal speech is beneath her. She prefers to save her voice for singing. The elf twirls anything they are holding when they pick it up… anything. The elf has no eyes in his otherwise unmarred face, but has honed his hearing with training and elven magic over thousands of years to be able to pick up on impossible to notice details. He is, however, too proud of this abilities to wear any coverings for the sockets, using his face as a reminder of his amazing perception. An Elven woman claims to be the last princess of her spire, she wears live fireflys are earrings, a small snake as a necklace and has a taimed mimic carrying her things. The Elf has an extremely difficult to pronounce name that he insists people call him before he will address them in conversation. This elf has an ‘armored’ skirt laid over their longer patchwork skirt. The armored skirt is an array of different spent wooden wands, tied together at the hilt and pointing downward. This elf wears a cloak of light gray gossamer and tulle, bunched up around the neck and pinned at the shoulder with a chipmunk’s skull. This elf’s clothes appear to be sheets of thin fabric, not sewn in any way. Instead a full body drapery of golden jewelry holds the cloth in place. Even over their hair, a delicate tiara holds the cloth to frame their face. They are covered head to toe and dislike showing any bare skin. Though this elf does not appear unique in any particular way, aside from their peasants clothes, other elves refuse to even acknowledge this elf’s existence. If pressed, no elves will admit there is event someone there that they are ignoring, and this elf adamantly refuses to explain. This elf’s eyes, the inside of their mouth and any visible veins (or spilled blood) appears to be made of Opalite, also known as ‘Angel’s Bone’ If pressed the elf will reluctantly admit their half-angelic parentage. This elf appears to have made their clothes out of cloth maps. They are excellent at navigation and have advantage on nature checks to find their way. The interior of their short cloak is of a location that is unfamiliar, and they try to hide the cloak’s interior if they notice any one looking. No matter where you are this elf can locate the best hallucinogens. If you’re in a forest, they find wild plants and mushrooms. If you’re in a city, they know a guy. This elf also, coincidentally, has disadvantage on initiative. The elf has had the tips of their ears cut off, to turn them into a mockery of a human. This elf has irises that are perfectly symmetrical, resulting in rings that make them appear like targets. The elf’s blood, sweat, and tears smell and taste like maple syrup, minus the sweetness. The elf has dapple spots like a fawn or young boar. The elf has braided ear hair. The elf has bark-like skin, which occasionally sheds in sheets. The elf lights up with faerie fire when they are emotional. The elf loves the moon and dancing in the moonlight. They have especial trouble meditating and paying attention on full moon nights. This elf has clipped their ears and is wearing platform shoes to look more human. This elf spends an hour every night trying to summon a get spirit in an effort to get back to the feywild from whence it was abandoned. The elf always knows the current phase of the moon, even if they can’t see it. If the elf is out in a forest, it knows the location of nearby herbs. The elf has a memento from their homeland that they keep with them at all times. They will do anything they can to keep from losing it.